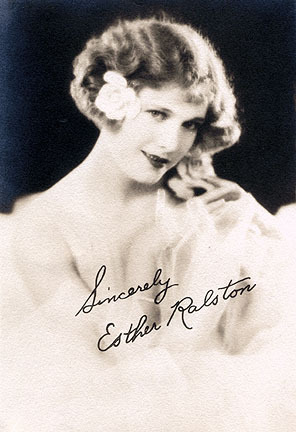 Esther Ralston was born Esther Worth in Bar Harbor, ME., Sept. 17, 1902. When the family, which included Esther, her parents and four brothers, decided to go on the stage in 1902, they changed their name to Ralston. When Ralston was 14 years old, she appeared in "Deep Purple" (1916) with Clara Kimball Young and other occasional films on the east coast. After touring all over the United States, the family arrived in California in 1917. She began appearing in small parts in films, with her first significant role being in William Desmond Taylor's 1920 production of "Huckleberry Finn." She also appeared in "Oliver Twist" with Jackie Coogan and Lon Chaney in 1922. With over 20 features to her credit, she was selected for the role of Mrs. Darling in "Peter Pan" in 1924 followed by another J.M. Barrie adaptation "A Kiss for Cinderella" (1926). Her appearance in "Peter Pan" began a life-long friendship with Mary Brian who played her daughter in the film. Another significant role for Ralston was in "Old Ironsides" (1926), directed by James Cruze and also starring Charles Farrell. According to Ralston, her favorite film was "Old Ironsides," and one of the worst, in her opinion, was "$50,000 Reward" (1924) with Ken Maynard. She also starred co-starred with Gary Cooper and Clara Bow in "Children of Divorce" (1927). Ralston was a popular star at Paramount throughout the second half of the twenties, but her contract was terminated in 1929 at the advent of the talkies. She blamed her then-husband George Webb who convinced her to go to the Paramount executives and ask for a $100,000 salary. When they refused, Ralston refused to sign a contract. She continued to make films until 1941 on a more sporadic basis, but she did bring in some good performances in secondary roles in films such as "Sadie McKee" (1934) with Joan Crawford and "Tin Pan Alley" (1940) with Alice Faye. Ralston was married to Webb from 1925-1933, singer Will Morgan from 1934-1938, and journalist Ted Lloyd in 1939-1954. She also made some commercials, acted in soap operas and did some radio and theater work (as late as 1975) and wrote her autobiography, "Some Day We'll Laugh," in 1985. She died Jan. 14, 1994.